(16/P80) TRENTON – A long-awaited beach and dune project by the U.S. Army Corps of Engineers that will bring critical coastal protection for homes, businesses and infrastructure between Brigantine Inlet to Great Egg Inlet is going out to bid, Department of Environmental Protection Commissioner Bob Martin announced today. The Brigantine Inlet to Great Egg Harbor Inlet, Absecon Island hurricane and coastal storm damage reduction project will cover 8.1 miles of shoreline, using more than 3.8 million cubic yards of sand. The project includes initial construction in Longport and Margate, and renourishment in Ventnor and Atlantic City. Initial construction of Atlantic City and Ventnor was completed in 2004. The bid opening date is Oct. 4. Work is expected to begin in early-to-mid winter. "I'm proud of the efforts of the team that has worked so hard to move this project forward," said U.S. Army Corps of Engineers' Philadelphia District Commander Lt. Col. Michael Bliss. "When complete, the engineered dune and berm will be one system with the purpose of reducing damages to the infrastructure on the island." "The City of Ventnor is excited to see the beach replenishment project moving forward and welcome the added protection our community will receive once the project is complete,” said Lance B. Landgraf Jr., Deputy Mayor and Commissioner of Public Works. We have supported the project from the start and continue to welcome the support and efforts of the NJDEP and Army Corps." The project will include a beach fill, with a 200-foot-wide berm and a dune to elevation +14.75 feet for Atlantic City and a 100-foot wide berm and a dune to elevation 12.75 feet for Ventnor, Margate and Longport. Atlantic City will see fill placed from Oriental Avenue to Jackson Avenue, as well as five outfall extensions or repair. The plan also calls for 0.3 miles of seawall and bulkhead construction along the Absecon Inlet frontage of Atlantic City. The forthcoming Absecon Island project represents another section of New Jersey’s coast that will receive engineered beaches and dunes, part of the Christie Administration’s post-Sandy goal to provide maximum protection to the shore. To date, a $57.6 million beach and dune project in Cape May County, encompassing beaches in southern Ocean City, the Strathmere section of Upper Township and Sea Isle City and a $38.2 million project to construct beaches and infrastructure in Loch Arbour, Allenhurst and Deal in Monmouth County are complete. 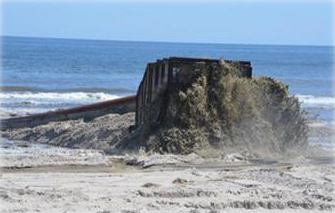 A second Monmouth County beachfill project from Elberon to Deal is also currently ongoing. A $128 million beach and dune construction project covering 12.7 miles of beach on Long Beach Island will be completed before the end of the year. The DEP also anticipates a long-awaited beach and dune project in Northern Ocean County, protecting coastal communities from Manasquan Inlet to Barnegat Inlet, will go out to bid in early fall.